Few dealers have been actively involved in bringing Western art to Asia but this Fall, Sotheby’s will hold an exhibition and sale of Modern works of art in China. The Ben Brown Gallery is also getting in on the action with its own show of Picasso’s late works. Art Market Monitor spoke to Anthony McNerny (click on the player above to listen to the interview) of the Ben Brown Gallery who has been helping organize the event. The New Line on Late Picasso: China Loves Him! 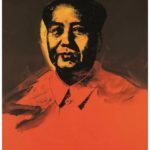 Can Mao—and the Chinese—Excite the Warhol Market?